I hate to keep picking at one particular field piece. But earlier when I discussed the differences between the Model 1838 and 1841 Field Howitzers, while I could note the differences between the types, I could not offer a set of comparisons for good effect. While entering markers for the Stones River battlefield, I recognized the set of photos I should have posted earlier! Consider this Model 1838 12-pdr. This example was cast by Cyrus Alger & Company of Boston in 1839. It was inspected by James Wolfe Ripley and weighed 681 pounds, based on the markings. 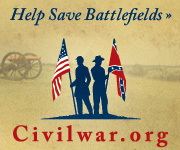 Last time I cataloged this piece, it was on the Kennesaw Mountain battlefield in Georgia. Just a little “cannon hunter” lore for you. Today it sits overlooking McFadden Ford in the northern unit of the park. But take note of the elevating screw. The head is only half covered by the base ring of the howitzer. The National Park Service tends to use a standard size carriage for displays. While purists, like myself, may wish there were models conforming to wartime standards. The taxpayer in my realizes that would be frivolously spent money. A one-size-fits-all carriage is practical for battlefield displays. 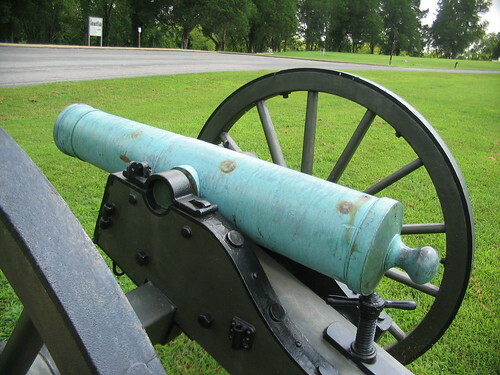 Now consider a 12-pdr Model 1841 howitzer on display at tour stop 1, overlooking McFadden Lane, just off the park tour loop. 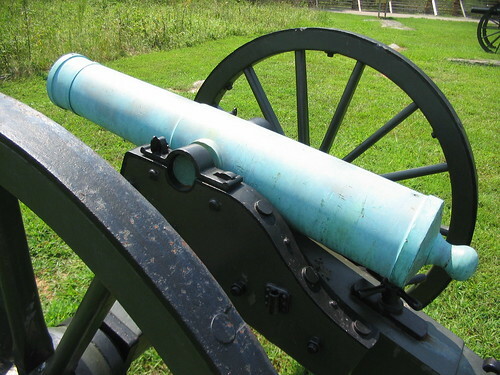 This piece is paired with another 12-pdr Model 1841 and a 3-inch Ordnance Rifle (which you just see in the background) to represent Parsons’ Battery (Batteries H & M, 4th US Artillery) at the battle. It is registry number 196, also from Cyrus Alger, produced in 1861. Inspected by Thomas J. Rodman, it weighed 839 pounds. Now look at the elevating screw. It is completely covered by the base ring. Thanks to the one-size-fits-all carriage, we have a visual indicator of the differences between these two models. As indicated in the chart, the earlier model (second data column from the left) was four inches shorter than the Model 1841 (third data column). By regulation the Model 1841 should weigh about 100 pounds more. The difference between the Stones River pair is 158 pounds. Certainly high, but not out of variance for bronze weapons. The ill-fitting Model 1838 in the top photo is a reminder that the “common” field pieces used by the Civil War armies were not produced without trial and error along with more than a few dead ends.